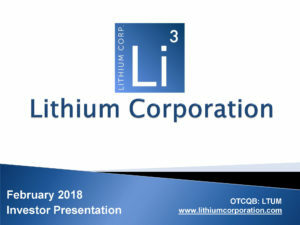 Lithium Corporation is a junior mining company focused on creating shareholder value through the discovery and development of lithium and other energy, and hi-tech mineral resources. Lithium is a strategic mineral with strong and increasing demand from the portable energy sector, particularly for use in batteries to power hybrid and electric vehicles. 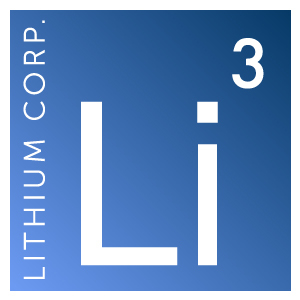 Lithium Corporation is currently developing two lithium-in-brine prospects located in the State of Nevada, USA along with a flake graphite prospect, and an early stage Rare Earth Element prospect, both of which are in British Columbia. Additionally the company holds a 25% interest in fee lands in the Tonopah Mining Camp in Nye County Nevada that has historically produced over 1 million ounces of gold and 100 million ounces of silver, and could potentially be put back into production. The Company intends to do more field work on these properties during 2019 as well as developing other potential prospects, and evaluating third party projects for acquisition. More detailed information about the Company’s properties can be found under Projects.